Planning a baby shower is no easy feat. You’ve got desserts to make, banners to hang, friends to invite and, of course, entertainment to provide, lest your guests (or the pregnant momma herself) grow bored. No pressure. But really, it can be done and there’s no question that you’re just the woman for the job. You’re reading this, after all, aren’t you? Way to step up your research game! 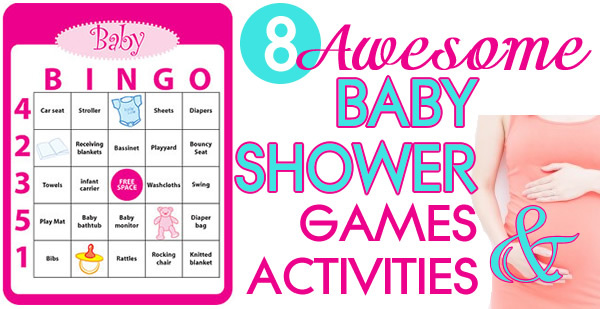 Speaking of games, the key to a successful baby shower — outside of really delicious food and great company — is to have super fun games and enjoyable activities lined up for the day. This idea comes to you from Jessica Hehir, founder of SugarAndTheSpice.org, and is a great way to break the ice at the beginning of your party. To play, you’ll have to first ask all guests to RSVP with a baby picture of themselves. Then, before the party, tack all the images onto a poster board with a corresponding number. For the twist, also include pictures of celebrities as babies, but don’t tell your guests. This will keep them guessing. “As guests arrive, hand them paper and pen and ask them to name that baby throughout the party,” says Hehir. Once mom starts to open her presents, energy can sort of die out. To keep guests engaged and excited about what’s happening, plan an activity or two during the gift opening session. You can play this game in addition to or as an alternative to “gift bingo.” It’s really simple. Prior to opening any presents, set a timer that buzzes or makes a loud noise when it goes off. The timer can be set for one minute, three minutes or however long you prefer. When the timer goes off, the person whose present is being opened wins a prize. Shannon Marie Lach, who runs a New York-based party planning company, loves the idea of putting lumps of colorful clay at every table for the guests to play with. She did this at a recent baby shower she planned and asked the guests to create clay animals for the baby. She said this gave guests, “something to do during the sometimes low energy gift opening.” Of course, if the lumps of clay are there before the party even begins, guests can work on their clay animals throughout the party. Another “busy your hands” idea similar to the clay molding activity above is to make bracelets or jewelry for the mom-to-be. You can buy your own beautiful beads, clasps and string online or at the craft store. Alternatively, buy a kit that’s already got everything you need. 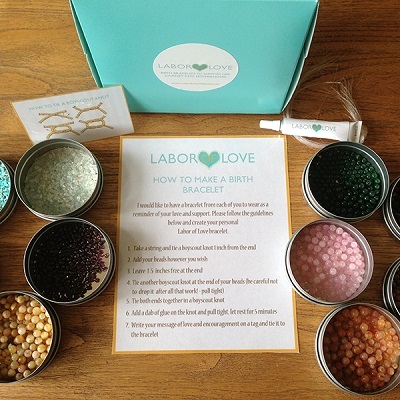 For example, LaborofLoveBeads.com has kits for 20, 30 or 40 people, starting at $159.99. Each kit comes with assorted semi-precious beads, pre-cut string, bead glue, directions and “love note” tags to attach to the bracelets. These bracelets, love notes included, are intended for mom to wear the day she goes into labor. Church says she prefers games that “don’t embarrass the mother-to-be or the guests, so no guessing melted candy bars in diapers or how large the mom’s stomach is.” Her go-to high energy game is relay races, but no running is involved. For this one, put guests into small groups of equal size. Once you begin, each team member must change a baby doll’s diaper, remove it and then pass the doll onto the next person. Repeat with every teammate. The last person to go must also dig inside a bowl of rice or beans for a (closed) safety pin. If you really want to throw guests a curveball, blindfold all the team members. That’s right, your guests are in for a gourmet treat. Well, a baby food treat, at least. “This is fun for foodies,” says Hehir, who suggests being “kind to your guests” by selecting colorful, fruity baby foods over meats and pastas. You can elevate the game by treating it like a wine tasting, complete with a fancy tasting display and tasting cards. “Cover the labels with a pretty ribbon or paper strip and attach a number,” says Hehir. 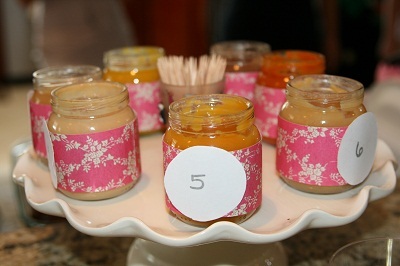 “Place toothpicks next to each jar and ask guests to list the fruits used in the baby food.” Try mixing things up with simple and complex flavors. Even consider making your own baby food so you know exactly what goes into it. Reveal the ingredients after each participant’s completed the tasting and hand out a prize to the person who got the most correct. You don’t have to be Michael Jordan to play — or win — this game. But you do need to have a little bit of aim! Provide guests with a bucket of 10 wadded up diapers of varying sizes (different age groups and manufacturers). For added enjoyment, you can choose to play this game outside and douse the diapers in water. Each participant takes a turn tossing one diaper at a time into a receptacle placed across the room. The person who gets the most diapers wins a prize.